Lama Ling aka Zangdok Palri Monastery , the ‘Glorious Copper-Color Mountain Monastery’, in Kongpo, was Dudjom Rinpoche’s main seat in Tibet before he left to India. According to traditional Tibetan geomancy and the astrological earth chart, Kongpo Buchu is one of the acupuncture points of the country. 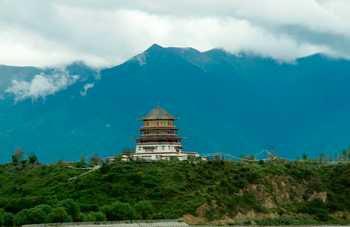 So in the seventh century, King Songtsen Gampo built a temple on this point in Kongpo, as well as on many others, to restore and rebalance the earth energy. Subsequently, Guru Rinpoche and a number of other great masters and tertön restored these temples over the years. In the late 1940’s, Zangdok Palri Monastery was damaged by earthquakes. The original temple was destroyed but for a small image of Chemchok Heruka. Dudjom Rinpoche nevertheless continued to bury treasure vases, build stupas, and do ceremonies to restore and balance the earth energetic points. Se Dorje Palzang, one of the sons of Dudjom Rinpoche, was based around Lama Ling, and was killed in the 1960's. In 1987, the ruined wall of the original temple still bore his fingerprints. During the unrest, Lama Ling was damaged. But when in due time, Semo Dechen Yudron, the eldest daughter of Dudjom Rinpoche and Sangyum Kusho Tseten Yudron, took care of Lama Ling with her husband Chonyi Rinpoche, and restored the temple. ↑ Zangdok Palri Monastery is named after Guru Rinpoche’s pure lane. ↑ Gyurme Dorje, Tibet Footprint, 3rd edition. This page was last edited on 7 February 2019, at 07:30.